Everything you need for your sterilizer, without worry or hassle, all right when you need it. Make your sterilizer happy. Call us now at 800-839-0722. We can answer your questions and start helping you save today! What is the ClaveCare Plan? The ClaveCare Package takes out all the guesswork, providing you with all your sterilizer supplies right as you need them. No more time spent shopping around every time you need something, we make it super easy! The package also includes training for your nurses and techs for cleaning and maintaining your sterilizer, with reminders for all the necessary tasks they'll ever have to perform. The ClaveCare Package can either come as a 1-year or a 3-year plan, and would include everything you need for the entire duration. Plus there are ClaveCare add-on options, some of which no one else can offer in the industry! What Comes in the ClaveCare Plan? 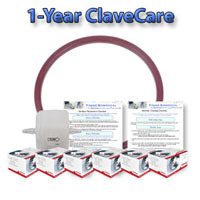 The ClaveCare Plan include all of your boxes of cleaner, HEPA filters, and a spare door gasket, all sent to you in convenient no-worry shipments. Either sent all up front, or in scheduled shipments right as you need them, that way they're not taking up your office space. We also include simple checklists that outline all of the cleaning and maintenance tasks for the new autoclave, making them very easy to understand and take care of. There's even a form with reminders that your techs and nurses can sign each time they perform the different tasks, that way your office can stay on top of everything! The 1-year ClaveCare Plan comes with all of your packets of Chamber Brite cleaner, packets for every week and a few extras too! For the automatic Tuttnauer sterilizers only, the ClaveCare Plan includes one replacement HEPA filter for that year. Plus you will also receive a spare door gasket! It doesn't need to be changed until later on, but we want to make sure you have it in case that time is nearing. The 3-year ClaveCare Plan comes with your packets of Chamber Brite cleaner for each week, plus a few extras. For the automatic sterilizers, the 3-year ClaveCare Plan includes four replacement HEPA filters, one for each of the four changes during that span. And again we include the gasket, which does need to be changed once within that 3-year period. We have ClaveCare add-on options that can send you shipments of printer paper, instrument pouches, indicator strips, and your mail-in biological testing strips. These could all be included in your regular ClaveCare shipping cycle, that way you have one less thing to worry about! 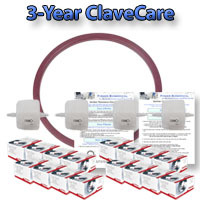 If you have an autoclave with a printer, you can add 3 boxes (15 rolls) of printer paper to your 1-year ClaveCare Plan, or 8 boxes (40 rolls) to your 3-Year ClaveCare Plan. If you need pouches or testing strips just let us know how often you use those supplies, and we can come up with your discount for that add-on option. 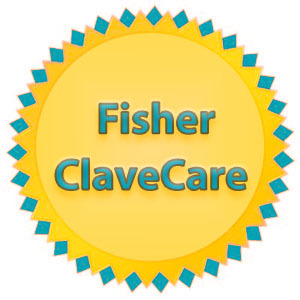 And for the last optional ClaveCare add-on, Fisher Biomedical is very proud to offer a whole extra year on your warranty, which would extend the warranty on all Tuttnauer sterilizers by 1-full year! With that extra year warranty, if during that year your autoclave experiences any problems we cannot simply trouble-shoot for you over the phone, you will be able to ship your system to us in Florida and we will provide warranty repair at no cost to you (apart from the cost of shipping the system to and from Florida, of course). As long as the repair would normally be covered by warranty and is not an instance of clear abuse or neglect, our technicians will service your system just as if it were under warranty anytime during your third year of ownership. Properly cleaning and maintaining the sterilizer is the best way to keep it running in tip-top condition, potentially saving you hundreds if not thousands over the years ahead. Call now: 800-839-0722 or submit the form at the top of the page for an instant quotation. Family owned and operated for over 31 years, Fisher Biomedical specializes in consulting with clients on their sterilization needs, having worked with medical, dental, and opthalmological offices, surgery centers and hospitals, veterinary practices, colleges and universities, government agencies and military installations, everything from small med spas up through major institutions and manufacturing laboratories across the USA. When you call us, you speak with an expert who can answer your questions and help you not only find the right system, at the right price — but also get up and running successfully, rapidly, effectively. merely ship you a box and tell you 'good luck'! Fisher Biomedical is very proud to offer the only extra-year warranty in the industry on your new Tuttnauer autoclaves! As an optional add-on with your ClaveCare Plan, we'll cover your new Tuttnauer for a whole extra year, just as if it were still covered by the manufacturer. If our Tuttnauer experts can't troubleshoot a problem over the phone, just ship the sterilizer to our office and we'll take care of all the parts and labor!